The Pink Dream Cremation Urn has a wonderful detail engraved into the urn, with a pearl pink color; truly a beautiful piece of art. Made from fine brass metal and coated to distinction with a true pink brilliant finish. "Everything about this is amazing,it is beautiful color, the price was great, the shipping was fast. We love it so much. In the future if we need an urn, we will come back. 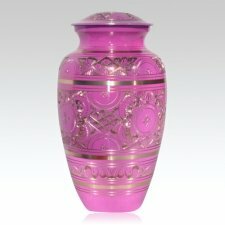 Pink Dream Cremation Urn is AWESOME! "Your customer service rep was extremely helpful and answered all my questions. Unfortunately I don't recall his name but I will always be grateful for his patience and understanding during a difficult time.